Didier Dagueneau, maverick of the Loire Valley, produced some of the greatest Sauvignon Blancs the world has ever known. Unfortunately, his life and his career as a vigneron were finished far too soon, in a manner which, though devastating, wouldn’t have been much a surprise to those who knew him. A perennial thrill-seeker and risk-taker, Didier, who also enjoyed professional motorcycle-racing and later, dog-sled racing, met his untimely end at the age of 52 when the ultralight plane he was piloting crashed shortly after landing in September of 2008. During his tenure at the helm of Domaine Dagueneau, Didier adopted a similarly unorthodox attitude in both the vineyard and the cellar. The wines of the Pouilly-Fumé AOC are prized for their minerality and perfume, with a smoky aroma (hence the name ‘Fumé‘, French for ‘smoked‘) often making an appearance in the best examples, Dagueneau’s not withstanding. This is largely owing to the presence of flint (which, combined with clay, is known locally as ‘silex‘) in the region’s famed limestone soils. These top-tier wines can age longer than your average Sauvignon Blanc–five to ten years for many, and even up to twenty for Dagueneau’s finest bottlings. Didier was not afraid to break the rules, and those who consume the wines of his domaine will be handsomely rewarded by his experiments. Low-yields were an established constant, but the boundaries of viticulture and viniculture were constantly pushed, from organic viticulture to natural fermentations to experimental barrels. Unlike most Loire Valley Sauvignon Blanc, Dagueneau’s wines have always been raised in oak barrels, though the size, shapes, and proportions of new to neutral barrels has varied with both vintage and vineyard. Didier may no longer be with us, but his children, Charlotte and Benjamin, have taken over the domaine and continue to produce stunning wines with clarity, precision, and freshness that wine critics agree would make their father proud. The most recent releases, now available in the store, are no exception. The 2010 Blanc Fumé de Pouilly, Dagueneau’s “entry level” cuvée, is intended to be a very direct, pure, and typical example of Sauvignon Blanc from a typical Pouilly-Fumé vineyard. It truly is a spectacular example of what wines from this AOC should aspire to be–brimming with chalky minerality and racy citrus. The 2011 Pur Sang, perhaps the Domaine’s most popular cuvée, is bursting with aromas of citrus, quince, and fine minerals, with mouth-puckering acidity punctuating the intense and ethereal palate. The grapes come from chalky limestone soils that are almost entirely lacking in silex. The 2011 Buisson Renard, grown on silex soil and formerly the most mineral of the Dagueneau cuvées, is tamed by oak ageing to form a rich, opulent wine held together by a firm, flinty backbone. 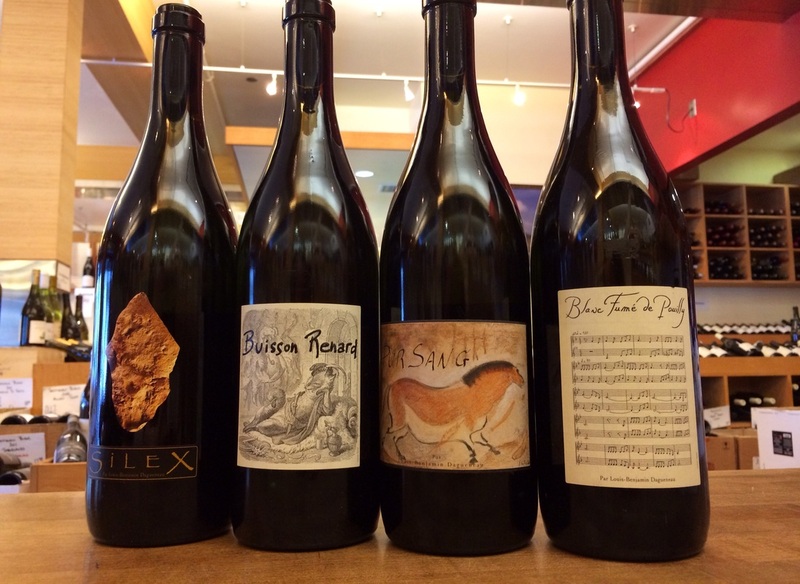 Finally, the 2011 Silex is the “Grand Cru” of Dagueneau’s wines. Highly sought-after year after year, this wine can be slightly more austere than its contemporaries, due to lower clay content in the soil. This may not be the right wine to pop open tonight, but those who are patient enough to wait for this stunning wine to reach its peak will reap significant benefits. For the slightly-less-patient, we also have the 2010 Silex in stock.